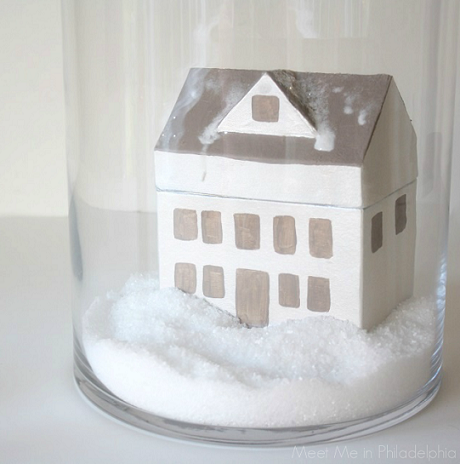 It's that time again, friends--it's Christmas craft time here on Meet Me in Philadelphia! I love spending the month making projects inspired by the season and sharing them all December long. 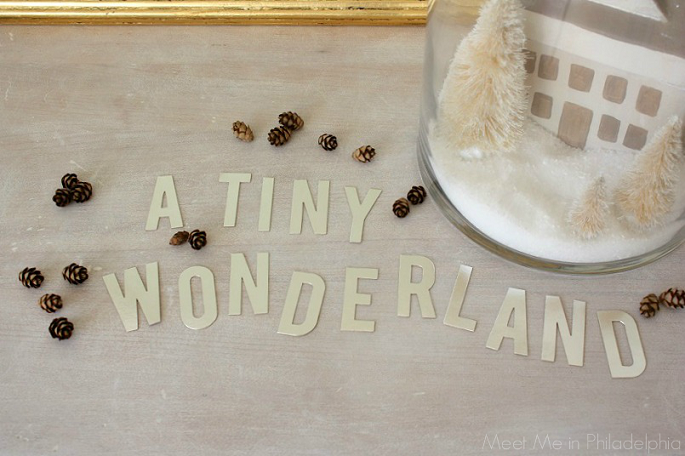 Today, I'm sharing my first craft: a tiny winter wonderland. This project started taking shape when I found a papier mache house for $1 while thrifting. Though its dower colors didn't scream "Wonderful Christmastime," its scale worked with bottlebrush trees I had for years, but the trees and little house needed to be brightened up. But what would I do with the house and bottlebrush trees? Display them on a table? 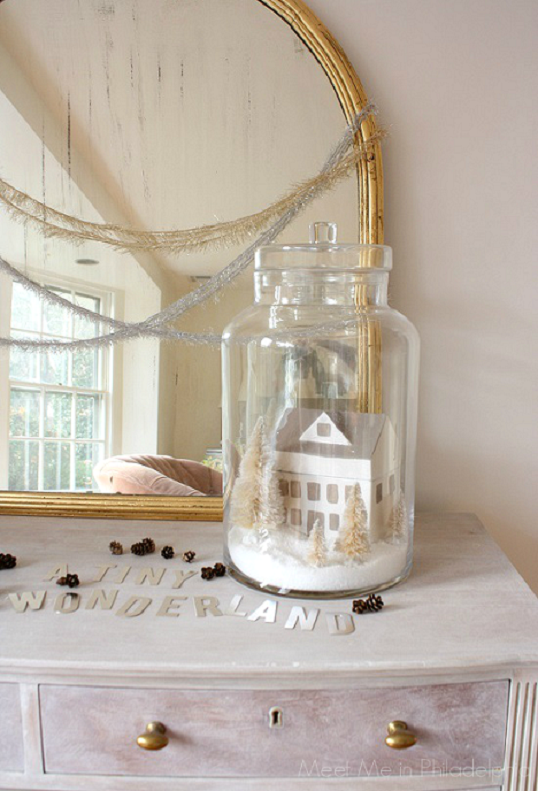 No, they'd go in a large-scale glass jar I found secondhand to create a winter wonderland under glass! I started by bleaching the bottlebrush trees. I filled a small plastic tub with hot water and a few caps full of bleach and let the trees soak for a few hours. 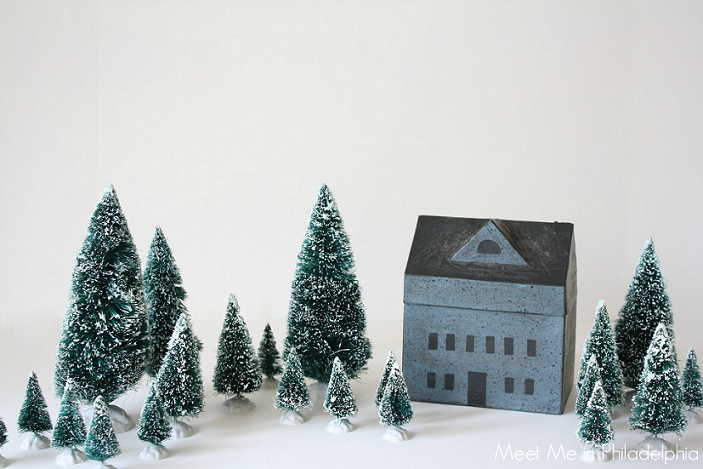 Slowly the green color and faux snow melted away and I was left with cream-colored trees. I took craft paint I had (Martha Stewart's paint in gray wolf and mother of pearl) to lighten up my papier mache house. The roofline also got a sprinkling of glitter for extra winter sparkle. While the paint on the house and the bleached trees dried, I had a revelation. Epsom salt! Yes, epsom salt. I had a carton of it in our bathroom and it would make perfect look-alike for snow. 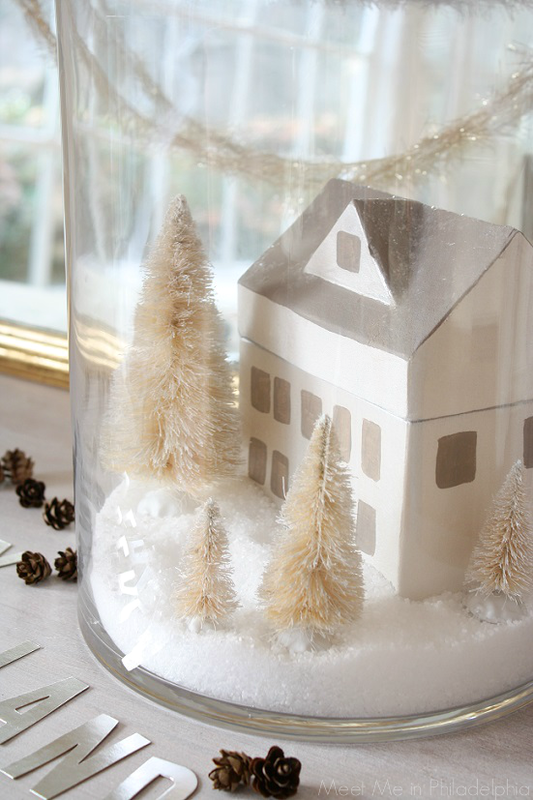 Also, the salt was rigid enough to hold the house and trees in place inside the glass jar. 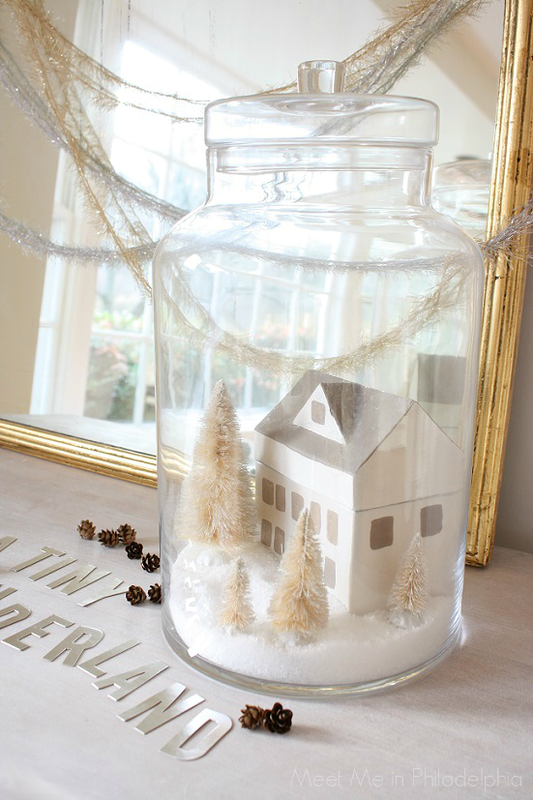 Inside the jar went the painted house and bleached trees! 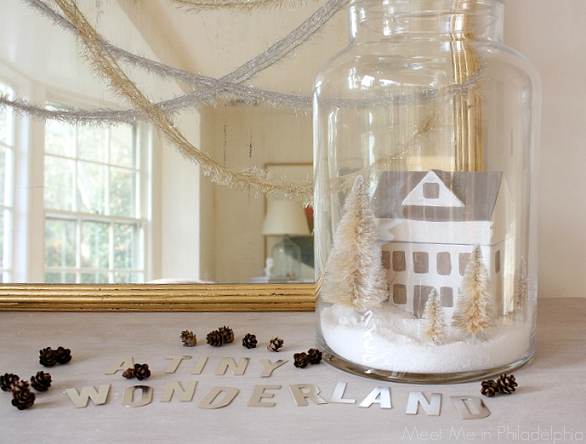 The large glass jar was the perfect spot to capture the winter wonderland feel on a miniature scale. I just love it paired with the limed desk and gold leafed mirror in our living room. 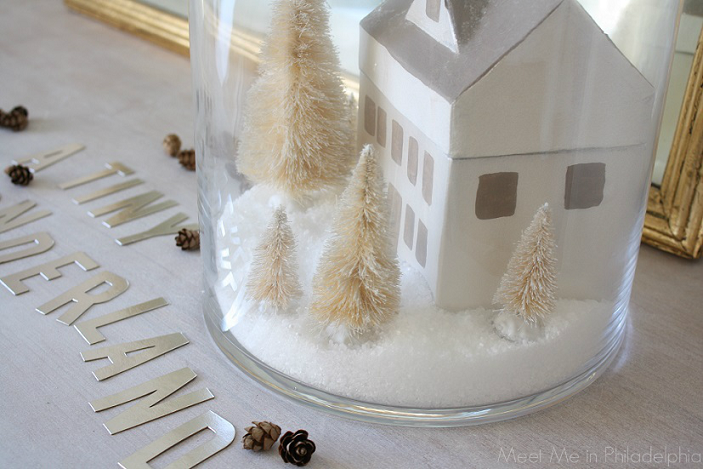 Completed, this tiny winter wonderland has me smiling and (strangely enough) looking forward to the first snow of the season. What do you think? It's adorable Ashley and love that it's all happy together in the jar. Surprisingly enough, I was doing a little crafting over the weekend myself. Maybe I'll actually get a post up about it. I also like those tiny little pine cones - so cute. I splurged a little bit and got the miniature nativity set that Pottery Barn was selling this season. I had a gift card and a coupon so I made light of the purchase. The pinecones are actually foraged from our backyard! I'm excited to see your craft post!! Really, really adorable! Love the neutral version much better! These are darling!!! Looks so lovely on your limed desk. Love what you did with these old items. Very resourceful and creative!!! 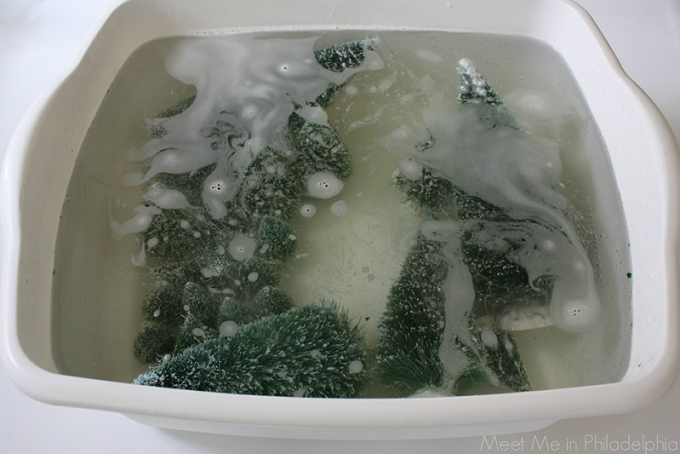 How did you know that bleach would work on those trees...genius. A little birdie named 'Pinterest' told me to try bleach! Worked like a charm! I love this. I just got some little houses at Hobby Lobby for the girls to decorate. I'd like to think ours will turn out as beautiful as yours...but I have a feeling they will be a bit crazier. :) And that jar is fab btw. Adding little girls to the mix would make it crazier--but definitely more fun! The jar was a secondhand find! I think it was, like, $25...not bad, huh? I absolutely love that idea!! Dont hate me I might have to do one for myself!! LOVE it! Hate you? I consider it a major compliment! What a cute idea. You styled it so pretty! If I have enough time- I would love to make one of these too. Thanks so much, Tracy!! I loved playing around with the styling here--not my strong suit but always fun to practice for pretty pics. Ashley, love it!! It is so charming and I am so impressed you bleached the trees!! PS you asked about the color I used in Bill's den and it is Gentleman's Gray, just like your room!! I had Benjamin Moore match some grass cloth wallpaper and that is the color they came up with. I am going to included your room when I post the whole room!! So glad you like the project, Sissy! Thank you for your kind words. And isn't Gentleman's Gray fantastic? I'm happy to know I'm not the only one who loves it. Cyber Monday Deal on My Etsy Shop!